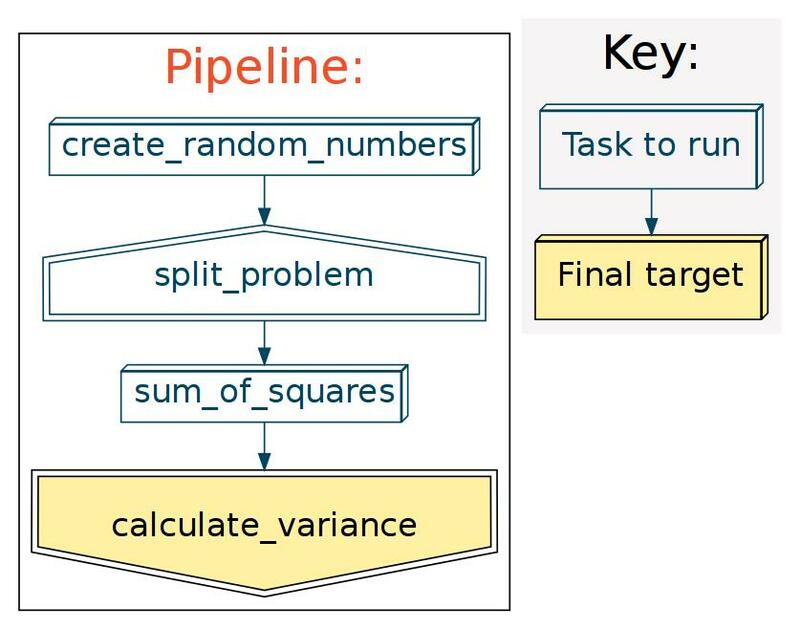 A common requirement in computational pipelines is to split up a large task into small jobs which can be run on different processors, (or sent to a computational cluster). Very often, the number of jobs depends dynamically on the size of the task, and cannot be known beforehand. Ruffus uses the @split decorator to indicate that the task function will produce an indeterminate number of independent Outputs from a single Input. Suppose we wanted to calculate the variance for 100,000 numbers, how can we parallelise the calculation so that we can get an answer as speedily as possible? merge the partial solutions back together for a final result. To complicate things, we usually do not want to hard-code the number of parallel chunks beforehand. The degree of parallelism is often only apparent as we process our data. Ruffus was designed to solve such problems which are common, for example, in bioinformatics and genomics. The output (second) parameter of @split often contains a glob pattern like the *.chunks above. Note that it is your responsibility to keep the Output specification tight enough so that Ruffus does not pick up extraneous files. "Code to split up 'input.file'"
Problem arise when the current directory contains results of previous pipeline runs. For example, if the previous analysis involved a large data set, there might be 3 chunks: 1.chunks, 2.chunks, 3.chunks. In the current analysis, there might be a smaller data set which divides into only 2 chunks, 1.chunks and 2.chunks. Unfortunately, 3.chunks from the previous run is still hanging around and will be included erroneously by the glob *.chunks. To help you clean up thoroughly, Ruffus initialises the output parameter to all files which match specification. The first order of business is thus invariably to cleanup ( delete with os.unlink) all files in Output. @split is a one to many operator because its outputs are a list of independent items. If @split generates 5 files, then this will lead to 5 jobs downstream. Normally we would use @originate to create files from scratch, for example at the beginning of the pipeline.